Technology and adult education are often discussed as two separate subjects, yet just as it is impossible to live one day without the impact of technology, it is impossible to discuss adult education without considering technology. 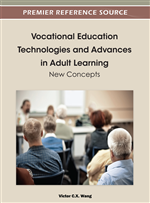 The growth of the field of adult education and the evolution of modern technology as well as the theorists and practitioners who were instrumental in moving the fields will be considered in this article as the foundation for a paradigm shift in adult education. Since effective adult education involves not only information dissemination but communication and collaboration among its participants, online learning activities and entire online courses influence how the field itself is viewed. This new paradigm will be explored in the current and future world of adult teaching and learning. While theory and practice are often discussed as two distinct silos in a discipline, in the field of adult education, Elias and Merriam (2005) articulate the need for theory as a foundation of practice. “Theory without practice leads to empty idealism and action without philosophical reflection leads to a mindless activism” (p. 4). Both theory and practice have evolved as a reaction to their historical context. Malcolm Knowles (1989) notes the continuing importance of adult education throughout and on history and described himself as being “part of a long and significant historical movement” (p. 72). Knowles (1989) credits a seminar led by Cyril Houle at the University of Chicago with initiating his own interests in the historical foundations of adult education. Building on Houle’s classic “The Inquiring Mind” in 1961, Tough’s seminal publications “Learning Without a Teacher” (1967) and later “The Adult’s Learning Projects” (1979) introduced the idea of self-directed learning and further influenced Knowles andragogical model. Tough’s (1979) discovery that adults were more successful learners if they knew the benefits from their learning and the negative consequences of not learning became one of Knowles assumptions about adult learners. Knowles (2005) detailed this historical development of learning theories in his classic text “The Adult Learner” in which he names nearly 100 significant contributors over 130 years from Thorndike and Dewey of the early days of the discipline to Brookfield and Mezirow today. For Dewey, experience was the beginning point of the educational process, not its end result. Thorndike formulated three laws that governed learning in both animals and human beings: readiness for learning, connection between learning and practice, and the effect that is the consequences of learning. Brookfield focused on critical thinking and critical theory and defined critical thinking as “reflecting on the assumptions underlying our and others’ ideas and actions, and contemplating alternative ways of thinking and living” (Brookfield, 1986, p. x). It seems obvious from this definition that critical reflection is not a process that is accomplished in a few minutes but requires an extended period of time. Technology can play a critical role in facilitating critical reflection over time. For example, while a classroom discussion relies on students’ instant insights and reactions an asynchronous online discussion affords students the opportunity to read another student’s comment, reflect on it, then return to the discussion at a later time with a thoughtful response. Brookfield (2005) further suggested the importance of critical theory as applied to the critical reflection on assumptions since this is considered a distinctive characteristic both of adult learning and of adult education practice.